"Wise Ways From the Wild" was a graduation speech never intended for college students that set the bar for speakers at the start of Carnegie Mellon University’s Commencement Weekend. On Friday, May 18, Sharon Carver addressed children and families at the kindergarten graduation of the Children's School, which celebrates its fiftieth anniversary this year. Carver has been the Children's School's director for 25 years. Listen Carefully: Paying close attention is important, just as animals remain alert with their ears and other senses for survival. Engage Uniquely: The unique adaptations we make to our surroundings are valuable. A toucan's large bill helps it to grab food and to regulate its body temperature. Similarly our innovations and other contributions can help make the world better. Cooperate Boldly: Teamwork is how humans not only survive but also thrive, just like how herds of animals work together to protect each other or how certain types of animal species have symbiotic relationships. Play Frequently: Humans develop creativity and learn how to solve problems while at play, just as animals play to develop important life skills. "Remember these wise ways from our exploration of animals in the wild as you migrate from the kindergarten habitat to your new schools in the fall,” Carver said. “Listen carefully, so you learn well, and engage uniquely so that you find ways to contribute your special talents and ideas to the group. Cooperate boldly with your diverse learning partners along the way, so that everyone can grow. Play frequently so that you can be your most creative selves, open to discovering all that the world has to offer." Carver credited the three kindergarten teachers—Caitlin Armbruster, Holly Blizman and Donna Perovich—for combining their talents to deliver an early learning program of exceptional quality, along with additional instructors who contributed to kindergarten cooking, music, physical education and classroom support. After the ceremony, children shared their favorite memories that echoed sentiments from CMU's Class of 2018, which included gaining a great deal of knowledge (about animals), making artwork (including finger-painting) and group projects (a play called "Mrs. Wishy Washy.”). "It's been amazing. My son made so many friends and just loved coming to school every single day," said a mother whose son had attended for only one year after transferring from another early childhood center. Some families had enrolled multiple children and grandchildren over the years. One boy, who was the third child in his family to attend, was particularly proud when his big brother visited the class to talk about anatomy. It is evident the school tends to retain both families and staff. Two 30-year veterans on staff include Linda Hancock, an educational administrator, and Jean Bird, an instructor of four-year-olds. Bird’s own children attended and now a grandchild is enrolled. Charline Tomer, an instructor of three-year-olds, will be retiring this year after 20 years of service. Carver concluded her speech with a message suitable for any 2018 graduates: "We hope you will always be wild about learning so that you will live an incredible life, one that is beyond your wildest dreams." The Children's School awarded diplomas to 25 kindergartners and bid them farewell, as they will transition to 16 different schools in the fall. 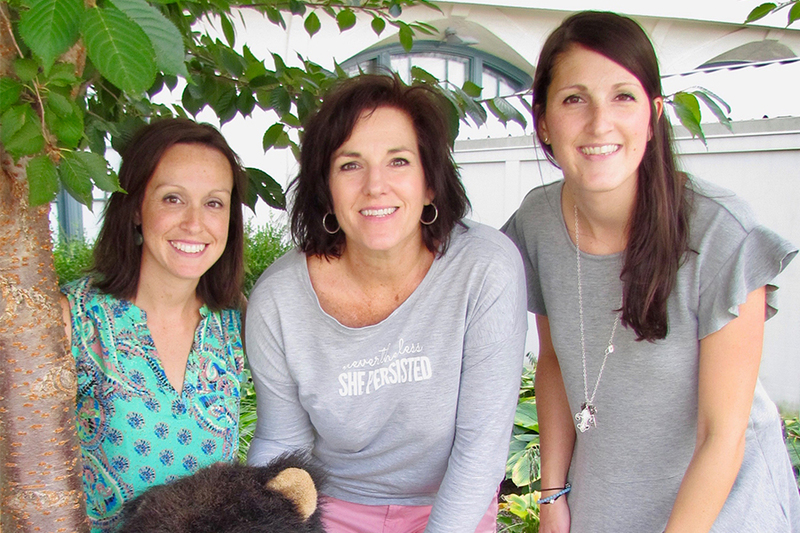 Pictured above are kindergarten instructors at the Children’s School (l-r): Caitlin Armbruster, Donna Perovich and Holly Blizman.